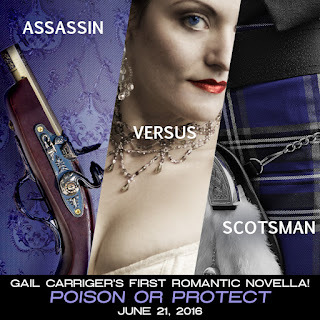 Poison or Protect is a stand alone romance set in the Parasol Protectorate world and although you can pick this book up even if you've not read anything else by Gail Carriger fans of the series will love the chance to spot a few familiar faces. Who would have guessed that I'd come to like Preshea considering she was one of the bullies in the Finishing School books? I have to admit I was a little nervous when I realised that she was going to be the heroine but I ended up really enjoying seeing a different side to her character. Preshea is kind of like a black widow, she's certainly put her finishing school training to good use since she's killed all of her previous husbands, but now she's nearly finished her time working for Lord Akeldama she has no intention of marrying again. If she can just carry out one final assignment then she'll finally be free to live life on her own terms and it's something she's really looking forward to. All she has to do is protect one Lord from assassination while also convincing his impressionable young daughter not to marry a fortune hunter. What she hadn't counted on was the fortune hunter's best friend and the rather shocking attraction she feels towards him. I loved Gavin's character, he's the perfect kind of hero who is capable of fighting alongside his woman not just wrapping her in a protective bubble. He's also brilliant at taking things slow and encouraging Preshea to open up to him and he loves nothing more than making her smile. Preshea initially comes across just as cold hearted as you might expect an assassin to be but once you get to know her you'll start to see a softer side that she usually keeps very well hidden. She's never really had anyone care for her before so it takes her time to learn to let Gavin in but even though their relationship develops quite quickly it never feels rushed or forced. 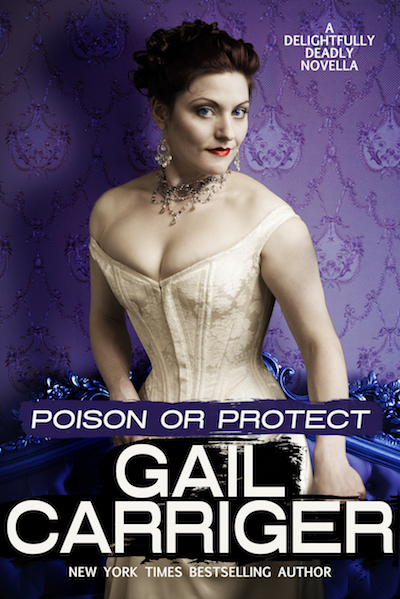 Poison or Protect was everything I've come to expect from one of this Gail Carriger's stories, it had great characters, a brilliant setting, plenty of humour and a wonderful (and surprisingly steamy!) romance and I can't wait to read more of these Delightfully Deadly novellas. Gail Carriger writes steampunk comedies of manners mixed with urban fantasy. Her books include the Parasol Protectorate and Custard Protocol series for adults, and the Finishing School series for young adults. She is published in 18 different languages and has 13 NYT bestsellers via 7 different lists (including #1 in Manga). 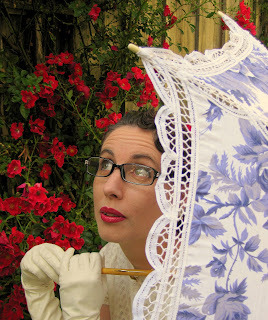 She was once an archaeologist and is overly fond of shoes, octopuses, and tea. A full bibliography of her work is available on her wiki.